When you create a custom form in PA-ETEP, you determine the number of questions, the types of questions, and the Likert rating scale. Create walkthrough, ‘look for,’ and/or ‘drop in’ forms to monitor building or district initiatives. Develop checklists, simple rubrics, and other observation forms and use them with not only your teachers, but also non-teaching professional educators and paraprofessionals. Build improvement plans or professional development plans. Once a custom form is built and used, generate a report that summarizes your data. With the custom form module, build a variety of forms for teachers, non-teaching professionals, supervisors, para-professionals, administrative staff, and more. Quickly and easily build forms to monitor the progress of district initiatives, or forms to facilitate professional growth plans or individual improvement plans. You can even build self-assessment rubrics with your own rating scales, language, components, and domains. Schedule a free demo and see how easy it is to create custom forms. at 412-877-8077 to inquire about pricing. We are interested in adding custom forms to our portal! Please send us pricing information. Custom Forms for Teachers – Coming Soon! 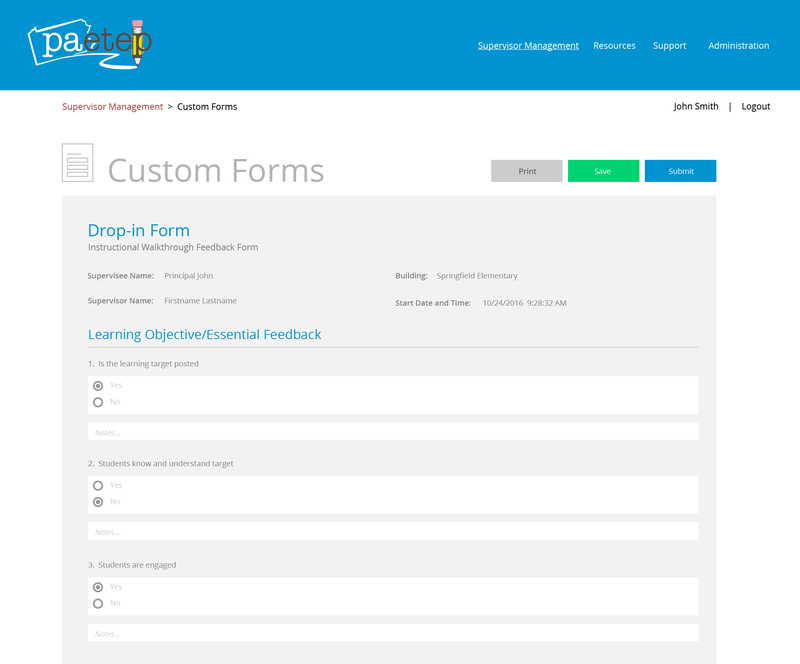 Custom Forms for Supervisors – Coming Soon!